Our team can strip back old damaged varnishes or finishes ready to be repolished, waxed or varnished. Small areas such as stains, burns, ring marks can often be treated without the need to strip the whole area. Decorative painted finishes can also be repaired and colour matched seamlessly. We are also specialists in gilding. We have a large range of lacquer, oils, waxes and polishes available to protect your wood and keep it looking beautiful. Our team have many years of experience in French polishing. It’s a very labour intensive process, applying many coats to build a high gloss finish. French polishing has a delicate, fragile finish which is prone to damage from liquids and heat, however, we can easily repair the affected area and blend with the existing finish. Our team also specialise in lacquer, oil, wax and paint finishes, so whatever protection, decoration or treatment you are looking for we can assist. We also have an expert logistics team ready to collect and deliver back your piece of furniture from your home to our studio. They are fully insured and will ensure it arrives safely with no further damage. For larger pieces are team can work on-site. Q. What is French polishing? French polishing is a time-served, time-intensive wood finishing art that gives a very glossy surface. A pad, rubber or muneca made of cotton cloth wrapped around a core material to apply a rubbed finish to the wood surface. Many layers of shellac mixed with alcohol are carefully applied, the early ones are very lightly sanded so that the shellac sanding powder fills the grain on open grain woods to give the super smooth finish, finally, it is buffed with wax to give the shiny, glossy finish. Q. How can I remove a cup ring from wood? Our team at the Fine Art Restoration Company have a host of tricks and techniques depending on the type of wood and the extent of the damage, that they can use to make the ugly mark disappear. With French polishing often only the damaged area needs treating and repolishing, rather than stripping down the whole surface. Q. What are the advantages of French polishing? 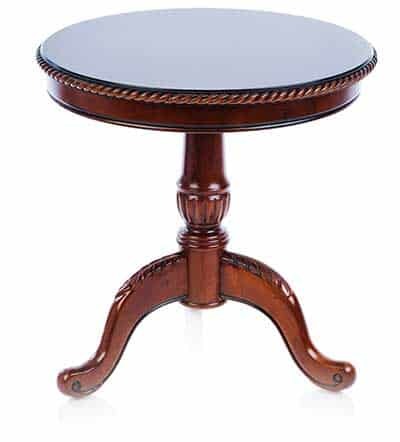 Apart from enhancing the beauty of the wood and the piece of furniture, French polishing provides a durable surface that will not require much polishing once dry. It will resist scratched and cracking and will not yellow over time. If damage occurs, it is easily rectified without stripping the whole surface. Q. What are the disadvantages of French polishing? A French polished piece of furniture is very sensitive to heat and humidity, so should be placed away from kitchens and bathrooms. It is also easily damaged by liquids especially water and alcohol, so avoid this temperamental finish on coffee table and bar tops. Q. What woods are best for French polishing? French polishing is suitable for all types of wood, however, closed grained hardwoods, such as cedar, spruce and maple are easier to achieve a perfect finish on. Open-grained hardwoods such as rosewood, mahogany and walnut, will require the grains filling with pumice of lightly sanded shellac powder.